Now that Europe’s debt crisis is unfolding all around us, shouldn’t we question why the world is determined to live beyond its means and not worry how it sabotages our common future? The debt crisis is a mere symptom of a deeper malaise. The fact is that countries, private companies and individual households can run only if they can borrow against their assets and hope that the debt will grow slower than the value of their asset. Most financial analysts will now tell you that this business is doomed because of the Ponzi scheme nature of the loan business, where borrowing is used to speculate to get more loans and so repayment becomes difficult and over time impossible. But this analysis is myopic as it misses the real nature of the problem: economic growth, as we see it, means living beyond one’s means. The cost of development has risen to such an extent that nothing is possible without loans or subsidy. Take agriculture in the debt-strapped rich world. It’s a fact that growing food is now so expensive that it needs huge subsidy from the public exchequer to be feasible (if not profitable). In 2010, the European Union spent some US $70-80 billion (47 per cent of its budget) on direct payments to farmers to keep them in business. The story is the same in other parts of the developed world. But what is not explained is that this subsidy is needed because of rising costs of land, labour, other inputs and environmental safeguards. Growing food is expensive indeed. Same with education: In the US, student debt has risen sharply—from $80 billion in 1999 to anywhere between $550 and $800 billion by June 2011, according to US Federal Bank estimates. 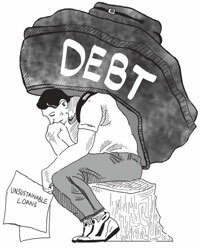 Now as unemployment looms, loan delinquency is on the rise because graduates do not have money to pay back. By June 2011, student loan delinquency was almost as high as the credit card non-repayment rate of 12 per cent. But what is not discussed is why the cost of education, particularly in the for-profit college industry, is increasing and how sustainable is this rise in the long run. The education story holds for other sectors as well. Rising health costs mean higher costs of insurance or lack of medical support for most. The list goes on. The fact is that cost of development is high. It makes money for a few but is unaffordable for most, because it is the exchequer that has to subsidise this development. This, in turn, increases public debt to crippling levels. What is not even discussed in the context of the current debt crisis is the other debt, which has been accumulated for growth. Each country’s release of carbon dioxide and other greenhouse gases into the atmosphere has reduced the cost of its growth. It is a loan from nature for economic development. But the cumulative emissions of a country—one country, the US, has contributed 26 per cent to the stock of emissions between 1950 and 2007—must be added to the cost of growth. In the case of natural debt, economies borrow the assimilative capacity of the environment by releasing waste gases faster than they can be removed naturally. This natural debt is similar to the financial debt of a nation, because it is a loan from nature taken to grow faster and at lower costs. The combined cost of growth is evident for all to see. The financial debt is leading banks and economies to collapse, while the natural debt is taking the climate to catastrophe, adding to costs of economic repair and increasing the costs of growth itself. This growth model should be on the line when the world meets to discuss climate change. The financial debt crisis is linked to the natural debt crisis and this is the real cost of growth that the world cannot afford. Question should also be raised whether the still-emerging world can afford this costly growth model. Remember, the cost of energy is higher today than it was when the now-developed world was building its infrastructure for development. Remember also that infrastructure in the emerging economies has not even been built. Financial loans are crippling the developed world now, when its development infrastructure is more or less in place; when its cost is to maintain this infrastructure or to regenerate or improve its efficiency or environmental performance. Remember also, its population growth is stable or even negative. This does add to costs that have to be paid to ageing segments, but it does mean that it has fewer or equal numbers of people to provide for. But our world needs development that has to reach millions of people—and millions more will be added to its populations in the years to come. It is time the world asked some really tough questions and looked for new answers. Can we go ahead with this unaffordable and unsustainable model of growth? Can we not do better than to tinker with the same economic systems that only bring more pain and more systems collapse? It is time we joined the dots—the financial debt and the natural debt—to look for the answers that matter. True that time for introspection is overdue but those who enjoy at the cost of others refuse to take corrective measures. The others too are progressing in the same line. Let us see where we meet. Modern civilization's debt to nature is infinite. While modern processes for production and use are utilising energy at the rate of 4 megawatts per square kilometer, living energy production and use is at the rate of 1000 megawatts per square kilometer and when return is practiced, the latter is at zero cost! It is great that the economic debate is on in these pages. The natural debt is such that we must reduce the ppm in the atmosphere from 389 ppm today back down to 270 ppm which is the pre-industrial level. Countries, private companies and individual households Ã”Ã‡Ã´ consumers - must change their production base from emitting carbon dioxide to sequestering it. This entails land redistribution and changes in land use. Neglected and destroyed agricultural labourers also need sequestration based production which in any case also happens to be their chosen form of production: food, trees and forests. Importing food from Ukrain and the USA is emission intensive and based on fascist tactics of competition between nations for Ã”Ã‡Â£LebensraumÃ”Ã‡Ã˜. The new international trading currency should be ebcu: emission backed currency unit: 30 GT CO2e this years means 30 billion ebcu value of the global economy. A decline every year of 1.5 GT puts a scientific limit on the international trade of the still-emerging world: surplus permits of the developing countries for exploiting hydrocarbons can be sold to the USA and with the income we can buy some renewable energy technologies from China. But the core production base is land, labour, food, trees, forests, agriculture: soil and water infrastructure: for putting money in the pockets of households so that local economy can be boosted we must get out of debt based currency and go in for Ã”Ã‡Ã¿deficit easingÃ”Ã‡Ã–: canceling FRBMA, XIII Finance Commission and thus all state debts. Tinkering is done because the required changes destroy market capitalism. We are giving the political economy a 30 year window with the ebcu to achieve contraction of emissions and finally net zero emissions. Either 30 hydrocarbon rich nations all agree for orderly management along political economy lines until the exit is achieved, or the 1500 GT emissions in stored hydrocarbons are released: by the USA as it bombs others to take away their emission space, and by China and India as they trade in renewables but refuse to accept that actually the transition is all about land and equity. In which case life as we know it will be extinguished. This is with reference to your editorial. One very important aspect of Government funds anywhere is that of leakages in tax delinquencies via astronomical extra-salary bonuses both inside and outside of corporate financial structures which enable also tax evasion. The best example is Greece. India too falls in this category (all the tax evasion through Swiss funds). Such earnings are also from transboundary operations which is what makes offshore holdings the source of 'hidden' pressures on the market which is what thrives on boom and bust operations in the markets. This is the kind of slush funds we find in the margins of all natural resource countries causing corruption. Also this is what boosts extraordinary boom in land prices and real estate and hence pressure on metals. The best example is the mining and oil industry. Another example is the super-earning services sector like banks and finance; and all industries dealing with mineral and natural resource companies which acquire vast earnings for itself. I have been an admirer of your refreshing thoughts and appreciate your editorial. It is true that much of the difficulties are caused due to a lifestyle beyond one's means. while there is a general concurrence about the pitfalls of the model in practice by the west, is it also not true that the same model has provided all the basic comforts to a large population for decades?. Is it not also true that west has the wisdom to overcome the crises? Also, what is the alternate model suitable to us. As a country which has practiced socialistic pattern for decades without any marked improvement in the lives of large population we find a hope of growth in the past 2 decades. I fully agree that we should not blindly follow the model of the west. We need to recognise the fact that the western model has created wealth too. I think there is nothing wrong in a model which enriches a smaller portion of the population to begin with ( which is probably the case in India) but the challenge is to widen the enrichment to the poorer section. The laws of Economics and the laws of Ecology are the same. The best models have been created by Nature with the liberty of time to test them and refine them to suit the present changing need. Nature provides DIVIDEND whereas man has invented PROFIT. At this juncture, we need to introspect about whether Carbon Dioxide is a problem by itself or the solution to healing toxicity with nature chemistry that is a reality but unknown to the common man. Global warming as we experience it is the planet having a fever to enable nature chemistry to run faster, to heal the increasing amounts of toxicity being spewed into the atmosphere. Fossil fuels emit toxins and gaseous fuels are hazardous as the band of nitrates it releases provide fuel to crimes of sexuality. A correspondence can be seen between the rise in sexual crimes and the use of L.P.G. and C.N.G. in metro cities. It is now time for the world to know that there are inexhaustible sources of energy available which is NOT nuclear and NOT centralised. This alone will avoid a recession and empower individuals, stop farmer suicide, avoid civil war, and the onslaught of the immense corporate machine. Water can be sourced from the sea, ecologically conditioned without the use of energy or machinery and food can be grown in deserts. Carbon Dioxide is an asset to agriculture and actually the limiting factor to plant growth. It is time to rethink or perish. it is total dismay the news that only fdi is the panacea for price control. I some time fail to under stand why people of poor nations who work at least double hrs than population of developed nations should be the sufferers. Ms. Sunita Narain says, and rightly so, that growing food is expensive in the US. This provides an insight into US pressure on India to open the economy to FDI in retail. President Bush was criticized for his off the calf remark during the end of his presidency that India’s middle class was expanding and that it was consuming more so the West was facing food shortage. The FDI supply chain business in India can come as a help to source available surplus supply at a lesser natural debt and meet the shortage in the West. This is one aspect over which Parliament is now agitating. But the other issue is too much industrialization at the rising natural debt. Industrial revolution is of course the result of the progress of science. Then do we curse science? Ex-President APJ Kalam favours nuclear energy as India can get rid of 30bn tonnes of carbon dioxide emissions per year. Another extreme view expressed in one of your posts has it that we will face annihilation unless we have a complex currency system in place at the pre-industrial emission level as the base index so as to check wanton economic development against the mounting natural debt. Interestingly, there was also a belief in the virtues of agrarian society and, specifically, of the peasantry. This was the foundation of Ratzel’s theory of agrarianism and Germany’s Lebensraum. Should we then go back in time and undo the industrial innovations? To be rational, the universe has inner-contradictions. Marxian dialectics, Malthusian premonition of unchecked population canceling itself out and Darwinian natural selection verily all accord with the Hindu belief that the universe has neither the beginning nor the end. This is why a Hindu can easily crack the egg-and-chicken puzzle. Evolution and involution are two sides to the same coin as are the force and matter. The phoenix-like rise of Hiroshima and Nagasaki give us the hope that despite the negative effects of science and industrialization and the mounting natural debt man can still find a way out to survive in his stride of progress. hats off to your acumen to bring to light the most important issues of the world. you have given a good solution which if implemented can go a long way in real safety of the world and its natural existence. But then the west has always been arrogant and has made the poor countries to pay for their faults.